The HV-3R from Millenia is an 8-channel microphone preamp that can be remotely controlled, and is intended for critical professional applications where sonically neutral microphone pre-amplification is required. The unit can also be used as a stand-alone, locally controlled preamp similar to the company's HV-3D, with which it shares its sonic characteristics. Using the supplied AElogic Windows based software, the unit can be remotely set-up and controlled, while also being part of a larger configuration. Simultaneous control of up to 792 channels (99 units) is available via Ethernet, and TCP/IP addressing allows control via the Internet. 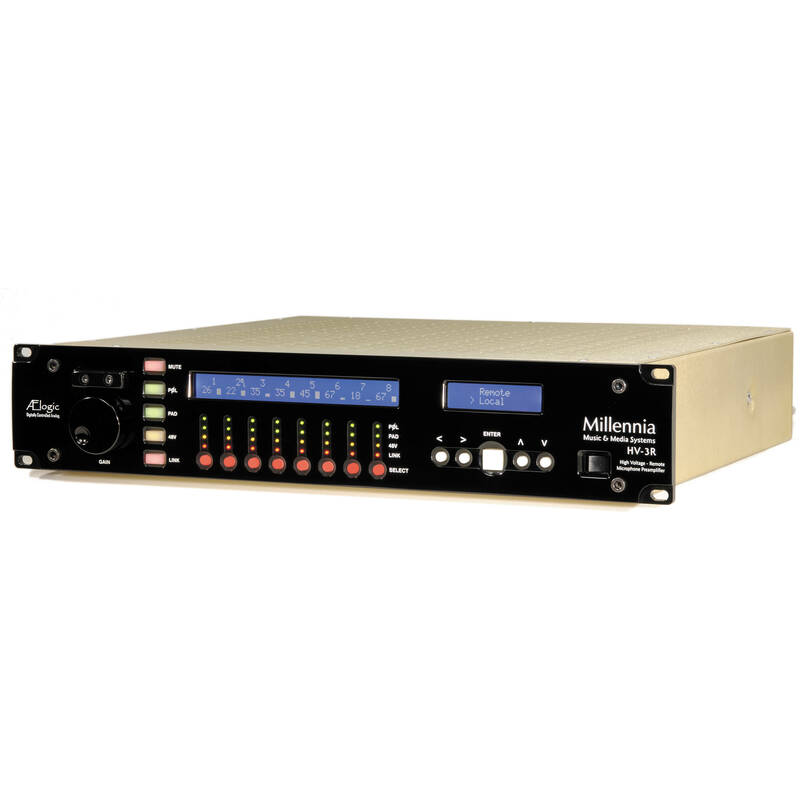 The MIDI control interface is compatible with Digidesign's Pro Tools "PRE" remote preamplifier protocol, allowing up to 9 units to be simultaneously controlled using MIDI in Pro Tools. Up to 16 units can be controlled per MIDI port with a standalone MIDI device, or other MIDI compatible software. While working on the design of the microphone preamp, the engineers at Millenia came to the conclusion that there's no such thing as a straight wire with gain. But the HV-3R's transformerless input, balanced audio path, and minimal amplifier design is as close as one can get to the goal of absolute accuracy and uncompromised sonic realism. Box Dimensions (LxWxH) 21.2 x 21.0 x 7.6"